These photos were taken during my research trip to the Jane Austen Center in Bath and the Bath Costume Museum. Visitors are very fortunate that they let you take pictures at both places. Enjoy! PICTURE 1 - Here's a nice ensemble of male formal-wear, pre-1810 because of the knee breeches (don't get me started). The lovely dark blue tailcoat is double breasted, and the patterned waistcoat coordinates. A nice fluffy sort of cravat (possible the Romantic style knot), and note also the way the sleeve ruffle of the white shirt drapes below the cuff of the coat sleeve. This display was in the Jane Austen Center, Bath. PICTURE 2 - This group is also from the Jane Austen Center in Bath. 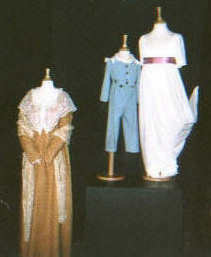 Shown (Left to Right) are: a woman's day dress with lace shawl, typical day-wear for a male child, and a girl's white muslin gown. PICTURE 3 - Two ladies of the earlier part of the Regency in white muslin ballgowns. Note the beautiful white-on-white embroidered trains, high waists, and the all-important accessory, the India/kashmir/Persian shawl artfully draped over each young beauty's arm! Bath Costume Museum. PICTURE 4 - Ladies' Daywear. 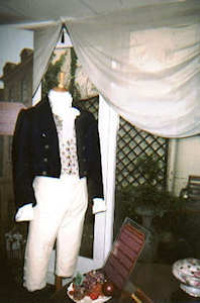 This mannequin is shown wearing a spencer (jacket) over a simple white day-dress. Note the fashionable plume on her bonnet and the reticule (purse) in coordinating colors hanging from her arm. Jane Austen Center, Bath. 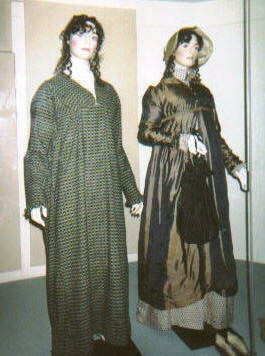 (Left) A dress like the lady on the Left is wearing could work as half-mourning because it has a checked pattern with black in it. I was particularly delighted with this figure because if you look closely, she is wearing spectacles (just like Lizzie from Devil Takes a Bride does on occasion). You might not be able to see it in the less-than-great photo, but she also has a "tucker" or fichu tucked into the neckline of her gown for added warmth and modesty. (Right) The figure on the right (above) is wearing a brown pelisse. (Not sure of the fabric here--it's shiny, possibly a satin blend.) Note her small, wispy bonnet and oversized reticule. (She must carry everything but the kitchen sink around in her purse like I do.) Bath Costume Museum. PICTURE 6 - Any shoe girls out there? Regency ladies' shoes. Check out the pair of "kid half boots" in the middle. These look pretty basic for daywear, but fancy versions in embroidered velvet or other rich fabrics could be worn with evening gowns. On either side of the half boots, the little shoes closely resembles ballet slippers. Slippers like these could be worn for day or evening. PICTURE 7 - Never enough shoes... More slippers. Note that the pair on the Left, of kid leather, are laced up with a ribbon. The middle ones look like dancing slippers to me, again probably of kid leather, but the pair on the right could be of satin. Bath Costume Museum.